It's a fact. Driving on a motorcycle is dangerous, resulting in motorcyclist fatalities 27 times more frequently than passenger car occupant fatalities per vehicle mile traveled. According to the Centers for Disease Control and Prevention (CDC), the National Highway Traffic Safety Administration (NHTSA) tracks fatal injuries suffered in motor vehicle traffic crashes. In the United States, motorcycles account for three percent of registered vehicles and only 0.6 percent of vehicle miles traveled, yet motorcyclists accounted for 14 percent of all traffic fatalities in 2014 and 17 percent of all occupant (both driver and passenger) fatalities. Unfortunately, the number of deaths continues to increase. Data from NHTSA’s Fatality Analysis Reporting System show that motorcycle-related deaths increased by 58 percent from 2000 to 2014. Helmets are the most effective motorcycle safety measure shown to save lives in crashes. When motorcyclists and their passengers wear helmets, the risk of death is reduced by almost 40 percent and the risk of head injury by almost 70 percent. 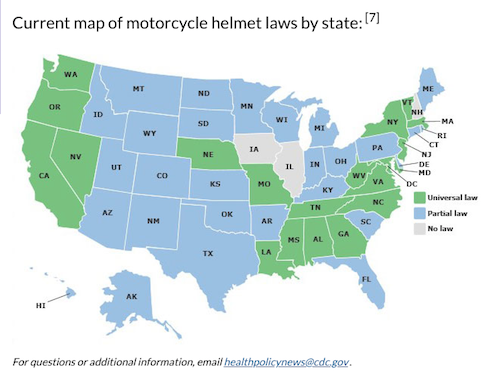 [CDC] So always wear a helmet when using a motorcycle. During pregnancy, there are two people to consider, not just one: the mother and the baby. Doctors generally recommend that you should try to avoid any sort of high-risk activities because some that can potentially harm you can also harm your baby. In a majority of cases, doctors usually indicate that motorbiking is of no benefit to the baby. The potential to fall and cause injury is too great to risk it. Even though some women have claimed to be motorbiking well into their second and third trimester without any problems, one quick plunge from your bike or one hit by another vehicle could easily cause trauma to your body and your stomach, which could injure the baby, or placenta, or lead to premature labor. Keep in mind also that the further along the pregnant woman is, the greater the threat to the baby would be should an accident occur. Previous: Is It Safe To Bicycle During Pregnancy? Next: Is It Safe To Play Lacrosse During Pregnancy?